This procedure outlines some of the important principles which you need to understand in order to optimise your business performance from the rainfall that you receive. It covers both Natural Resource Management (NRM), livestock production and business related topics, each important to the ongoing sustainability of your business and property. This procedure brings together much of the information and must-dos outlined in the previous procedures, to ensure that you have plans in place to tackle what nature throws at you, and that you are in the best possible position to deal with all situations. Rainfall is the key driver of production in all grazing management systems. To ensure that the rain that falls on a property is efficiently converted into sufficient quantity and quality of feed, the pastoral production system and business which operates on it must be in a ‘rain ready’ state. This requires that when the rain falls on the property, it soaks into the soil and the property and business are each in a state whereby they capture productivity that the rainfall will provide. Rain stimulates growth of palatable and productive ephemeral, annual and perennial species. This plant growth provides energy, protein and key elements to achieve favorable levels of livestock production. Other measures relating to NRM outcomes, such as groundcover at key dates. These performance indicators can then be measured and monitored to assess annual production efficiency. Using rainfall as part of a performance indicator can add valuable context to poor seasons, by allowing you to measure performance in below average rainfall seasons, in the context of rainfall received. Landscape function provides a measure of the landscape’s capacity to capture rainfall and nutrients that directly contribute to plant growth and productivity in the system. Landscape function provides an assessment of landscape condition and resilience. A key step in ensuring you are ‘rain ready’ is to ensure your pasture is conditioned in a way to manage the next rain event, and just as importantly, to manage through dry times. Maintaining landscape function ensures pastures are ready to respond to the next rain event. Conditioning pastures to respond to rainfall involves strategies such as maintaining adequate cover levels and managing to maintain perennial in the system. Ground cover assists rainfall infiltration and efficient nutrient cycling. By managing the utilisation of perennial grasses to the recommended rates, you are maintaining landscape function, allowing responsiveness and also keeping a mix of perennials in your pastures. Perennial grasses are important for maximising sheep production and rain‑use efficiency. They respond (produce green leaf) to summer storms and survive between infrequent showers. 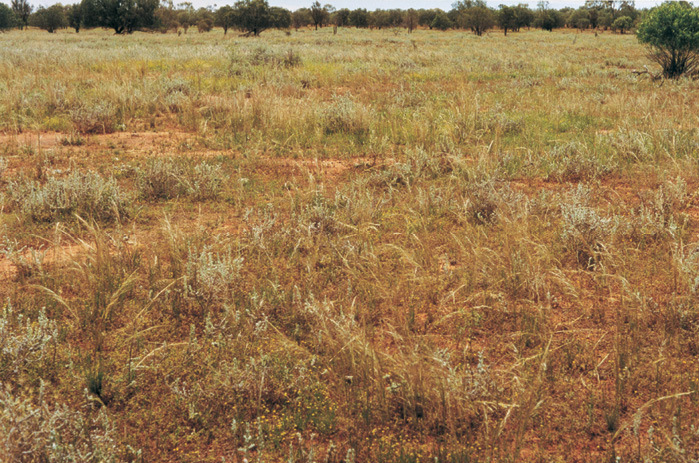 Similar to landscape function, the land condition gateway of the Grazing Land Management system, which has been developed for Northern pastoral areas, considers the capacity of the land to respond to rain and produce useful forage and is a measure of how well the grazing ecosystem is functioning; this is essentially the landscape function. There are three components to consider in determining the level of functionality of the land system. Overgrazing can negatively impact the rain readiness of your property. Excessive populations of domestic, feral and native grazing animals combined with dry conditions when feed levels are reduced have been primary contributors to the degradation of areas in the rangelands. From a pasture condition perspective, invasive native scrub, applicable in areas that are prone to scrub encroachment, are a non-preferred ‘increaser’ species that, unless well managed, will dominate the system and reduce its ability to convert water and nutrients into useful feed (palatable green leaf) and consequently animal production. A decline in landscape function often results in poor responses following rain events. “Make hay while the sun shines” – these conditions don’t last forever! Good seasons never seem to happen frequently enough, according to many pastoralists in Australia. How to capitalise on the good seasons takes careful planning, adaptive management, and risk management (and a bit of luck in some cases!). There are many rules of thumb regarding the impact of the ‘good seasons’ on agricultural businesses across Australia, but importantly, the reality of the good season is that you need to be ready to take the opportunity to benefit from the seasonal conditions, which will help provide the capacity to buffer you against the poor seasons. The inherent knowledge that you have developed, as to how many animals you can comfortably carry on your property in a good season, is something which you will develop through experience of good and dry times. State your risks and analyse risk before making any decisions. There are others, no doubt, and you will have access to local information which will best fit your operation. Be sure to utilise all available sources of information for devising your strategies and improving the number of options you have available to you. Getting through a poor season, or run of poor seasons, requires patience, resilience, and a significant amount of planning. A mob which are always the first to go. By having set your own key dates and trigger points, whereby you assess the current conditions, outlook, and other factors, including market, risk, resources available to the business, you can strategically work through the issues in a fashion that allows you to be in control of the situation. Trigger points are calendar dates beyond which decisions to buy or sell livestock should not be delayed. They can be identified by summarising long term simulated pasture growth record to show when the prospects for pasture growth for the next three months are highest or lowest and the variability in growth from year to year. Revisiting and adjusting these trigger points are an important part of the process of managing poor seasons, and indeed emerging in a resilient state, physically, mentally and financially. Keep revisiting your plans and adjusting them, but don’t put off the inevitable. Early decisions are often the ones made with the least amount of emotion, as they are not forced decisions. Managing your pastures and land condition appropriately will help your country recover faster. It will be more ‘rain ready’. Landscape function remains important during dry times, as maintaining function will assist with recovery. Tool 12.20 Recognise and minimise decline in landscape function. 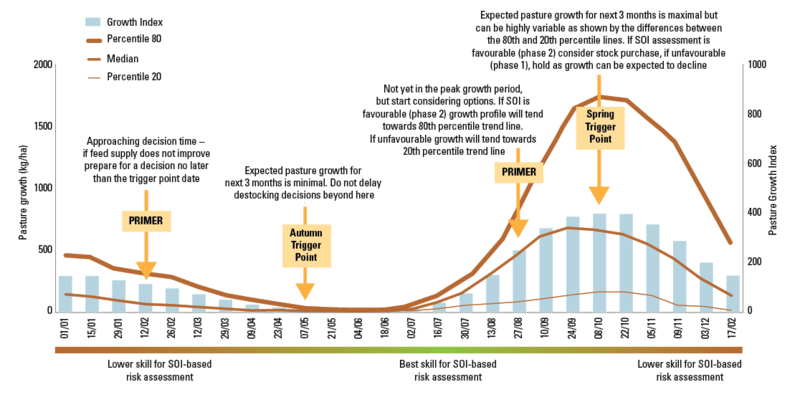 Example of how to use the pasture growth profiles and critical percentile values to determine trigger points beyond which decisions that depend of future growth should not be delayed. Note the ‘primer’ point, some time before the trigger point, when preparation for a decision and consideration of options should start. AWI drought pages have a range of relevant publications, plus links to other organisations relevant to managing during a drought, as well as recovering after rains arrive. State Department of Primary Industries websites. Keeping a watchful eye on the performance of your property and business, will ensure that you have a strong handle on the exact position of your business, plus you can accurately forecast the next year’s performance under best, average and worst case scenarios. Monitoring of your property’s assets and performance are as important as monitoring business performance and assets. These approaches involve understanding and reading the landscape and identifying indicators of better function, or poorer function and degraded parts of the landscape. These approaches highlight the importance of rangeland ecological function and how it plays an important role in key processes such as infiltration of rainfall received. Tactical Grazing Management and other grazing management approaches provide a range of tools for assessing landscape to guide management decisions, e.g. assessment methods for ground cover and perennial grass utilisation. It also considers approaches to setting a stocking rate, the impact of non-domestic species and changes in shrub cover. All good NRM monitoring considers the prevalence, impact and cost of managing weeds. Weeds pose a significant threat to Australian rangeland systems and threaten pasture condition and woodland condition. In addition to threatening biodiversity through impacts on individual species and communities, they have the ability to downgrade key ecological processes. Costs of control, containment or prevention. Control and monitor: control, monitoring and follow-up are all aspects that will assist in achieving good weed control. Weed management is an ongoing component of property and grazing systems management.